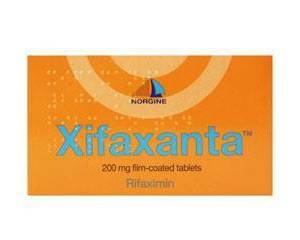 What is Rifaximin (Xifaxan) used for? Rifaximin (Xifaxan) is an antibiotic, a medicine that kills bacteria. The active ingredient rifaximin acts locally in the intestine and is not absorbed into the bloodstream. Rifaximin (Xifaxan) works by destroying certain bacteria in the intestine (E-coli bacteria) that cause diarrhoea. Rifaximin (Xifaxan) is a prescription-only medicine. The medicine is used to treat travellers' diarrhoea. Travellers' diarrhoea is caused by consuming food or water that has been contaminated by bacteria, viruses or (less commonly) parasites. Rifaximin (Xifaxan) wipes out pathogenic bacteria like E-coli, and in doing so, alleviates symptoms such as diarrhoea, stomach cramps and nausea. This medicine is only intended for treating diarrhoea that is not accompanied by fever or blood in the stools. Rifaximin (Xifaxan) tablets can be taken with or without food. The tablets should be swallowed whole, without chewing, with plenty of liquid. If your symptoms do not improve within 24 to 48 hours after starting the treatment you should see a doctor. It is important that you finish the entire course, even if you feel better. Stopping the course too soon may cause the infection to return. For more information on how to use Rifaximin (Xifaxan), see the package leaflet. Adults and children aged 12 and above: one 200-mg tablet three times a day for three days. Rifaximin (Xifaxan) is not recommended for use in children under 12 years of age. Read the package leaflet before use. Consult a doctor if the side effects are severe or persistent. For a complete list of side effects, see the package leaflet. You have diarrhoea accompanied by fever and/or blood in the stools. Consult a doctor on the use of Rifaximin (Xifaxan) if you have a liver disease or other serious ailment. Be sure to tell the doctor what other medicines or nutritional supplements you are taking when you order. This is to avoid potential interaction and to make sure that the combination with Rifaximin (Xifaxan) is safe. Rifaximin (Xifaxan) should not be used by pregnant or breastfeeding women without consulting a doctor first. Rifaximin (Xifaxan) may cause dizziness. Stay out of traffic if you do experience this side effect. Alcohol may cause or intensify side effects such as dizziness and fatigue. Avoid drinking alcohol while taking Rifaximin (Xifaxan).